Oh, it seemed to have so many possibilities! Who would win? The Foo Fighters with their brilliant take on "Falling Down"? The iconic Starman himself, gone but not forgotten, who could have been a hero himself -- David Bowie? Or the ever rockin' Tom Petty and the Heartbreakers? Here is how the voting shook out, folks (and why doesn't this line up the way I want it to? I say that like a question, but if you truly send me "html tips" in messages, I'll throw a snowball your way...I've got plenty to spare). Seems pretty clear who the favorite was and I have to admit that this is one of my favorite Tom Petty songs. The guitar riff alone makes me what to kiss Mike Campbell. If you haven't seen the movie/documentary "Running Down a Dream," you're really missing out. 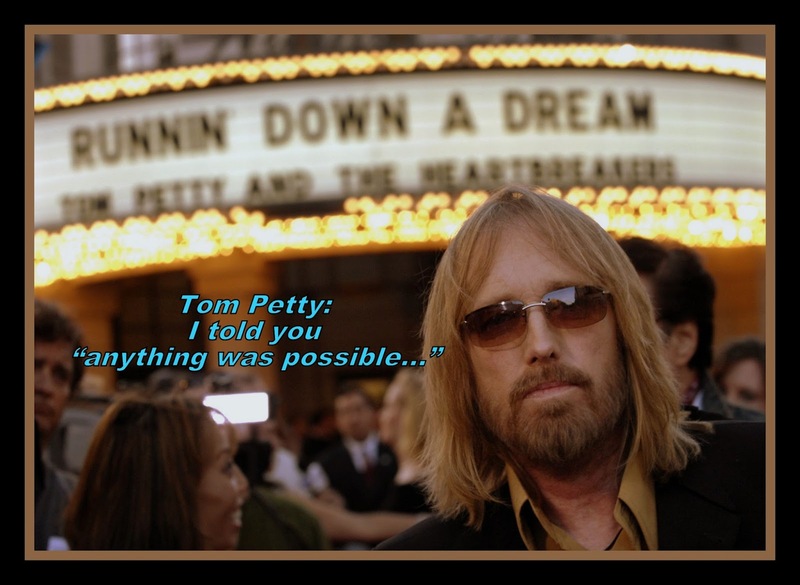 Very well done, it will be the definitive tale of Tom Petty and the Heartbreakers. Good and bad are well balanced and I came away feeling like I'd actually seen (or heard) some truths. Refreshing. Wait, don't leave yet! My peeps are posting their results tonight, too. Run on over to their blogs and see how your vote stacked up against everyone else. See you back here on the 15th, motivated or not! Wow, a spreadsheet. I'm impressed. I looked up 'running down a dream' on Netflix. Nope. You have to search Tom Petty. Now in the queue. I was offline for the vote, but I know I would've voted for the Foo Fighters. Back at ya, my friend! Interesting voting. I didn't have a horse in this race. You are always welcome as an observer...horse races need that, too. My dear friend, DOC MacSIS, it may have been a blowout but I still think this was a wonderful concept. I loved it so much so that I may do a "Twisted BOTB" Motivational installment myself on Jan. 1, 2018. As I said before, I think this was my favorite of your BOTBs. My memory ain't what it used to be (and never was), so let me axe: Was this your first ever "Twisted" BOTB? Off the top of my head, I can't recall you straying outside of the standard One-Song/Two-Versions format before. So busy this week, neglecting my comments! Forgive me. Now that I see you have given the McCarthy Seal of Approval, I'm going to do more...and soon...like two days from NOW. I'm a rule follower where others are concerned. Your (and FAE's!) creation, your rules, I follow it out of solidarity with my peeps. But when I realized I could tweak it, I'm all in for that, too. So expect some "themes" to evoke emotion or response. I have the DVD of Running Down a Dream. It is fantastic. I hope to see them again in concert this year as they make their 40th anniversary tour. Wish me luck for good seats! I stumbled on that and I was so impressed. You hit the nail on the head: fantastic! But, of course it was a 'love feast' for atom. I wouldn't have stood for it turning out any other way. You make dear, have taken BOTB to new heights. I'm so delighted you. Continue your n a wonderful blog hop in such a grand fashion! Darling FAE, always a kind word and encouragement. How I love you, dear gal! Thank you for starting it all with my ole' pal, McCarthy. We actually did watch the documentary recently - great stuff. Oooohhh, it was a ray of light in a dismal rock doc year. Glad you liked it! Your outcome on this Battle looks the way my own Battle this time will likely turn out. Unless I get a whole lot of votes otherwise on Sunday. Your Battle turned out as it should have songwise, but I still liked the Foo Fighters video best for the parody aspect. That video is on my top 20, for sure. More and more, I dig Dave Grohl...for SO many reasons! I didnt win but i stand by my decision! I love that song and video for Foo Fighters. Girlfriend, how could you go wrong with Foo Fighters? Hope you are enjoying your new place and 2017 is off to a great start. Love ya. I wanted to stop by to wish you a very Happy New Year. I hope that this year will be a very good one for you, my cherished friend. You deserve it. Much love and many hugs.